Breaking Bad is the most superficially comparable American series (drugs! ), but the storytelling contrasts that Narcos presents are far more interesting than the points of similarity. The framework for Bad is Walter White’s descent into evil, a slow burn that sees five seasons devoted to the hellward journey from Mr. Chips to Scarface. As the size of the drug shipments increase, so too does Walt’s ego. He’s addicted to the drugs in a different way, and soon he reaches a point where the only thing to do is to keep going. Maybe this tale-as-old-as-time formula just works for drug-dealing criminals, from Walt to Scarface to Blow‘s George Jung to American Gangster‘s Frank Lucas. On paper, it certainly fits Pablo Escobar. And yet Narcos doesn’t give us very much of the upstart crow Escobar. We meet him in the pilot episode smuggling appliances and marijuana in relatively modest loads, but it doesn’t take the whole season for him to kickstart his cocaine empire. Importantly, the question of Pablo’s morality is never clouded to anyone except himself: he believes himself to be an upright figure deserving of respect, while pretty much everyone else can easily see that he’s a monster. The Pablo we meet at the beginning of Narcos isn’t necessarily the Pablo we’re left with at the end of season one, but the change isn’t from Good to Bad or Small Time to Big Time. If anything, Pablo simply narrows his focus as each episode passes. Tonally, Narcos mirrors this inward focus as it hurtles along. When Pablo begins his venture he displays a mixture of determination and joy, exploring new business partners and building new facilities as his operation outgrows the last one. Intercut scenes with Boyd Holbrook’s DEA Agent Steve Murphy, the man who will eventually hunt Escobar and the more honorable half of Narcos, compare a girl enrapturing him in a bar to cocaine enrapturing Pablo. Both men find both of those qualities in their work, a blend and balance of determination and joy, but it’s clear from the first episode that one of those is about to evaporate. 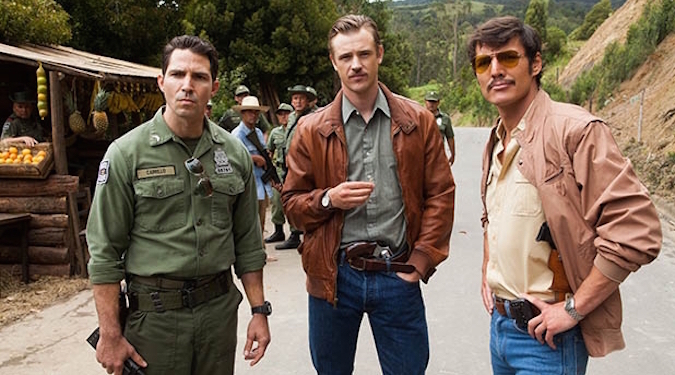 Speaking of Murphy, one attempt at criticism trumpeted by reviewers less brilliant and undoubtedly less handsome than myself concerns what appears to be an attempt to make Narcos into an American story, complete with a blonde white guy named Steve as the counterpart to the villainous Colombian. Narcos addresses this beautifully within the show itself, both in explicit statements — one character notes that in the end “Colombians will be the heroes…and the victims” — and in more subtle characterizations. Steve is more fish-out-of-water than hero, losing the same joy that Pablo loses as the determination takes over, and when he puts a gun to someone’s head and states that he’s the boss it’s clear that Pablo’s influence has had a severe effect despite the two never coming face-to-face. Murphy and Pedro Pascal’s Javier Peña help to bring an American perspective to the story, but it’s a Colombian story from start to finish. And besides, Narcos is at its best when the political influence of the United States is depicted as a flagging swirl of semantic confusion in the face of Pablo’s supreme focus. The fact that Murphy or Peña resist American stereotypes is great and all, but Colonel Horatio Carillo does more to paint the primary struggle of Narcos as a distinctly Colombian struggle. Maurice Compte (who loses one point for not looking very Colombian but gains it right back for having been in Breaking Bad) plays Carillo with almost as much reserved rage as Wagner Moura instills in his portrayal of Escobar. He writes off Murphy for being a tourist, writes off the American bureaucracy for dancing around diplomacy while Pablo kills at will. His fight with Pablo is a highly personal one, one that’s oftentimes easier to invest in than the early drive of Murphy or Peña, and so his inclusion as a major player in Narcos is vital. Fittingly, Moura and Compte share many of the same qualities as actors, chief among them being the ability to convey a great deal without saying a single word. Pablo orders killings by raising his eyebrows briefly, Compte relives the deaths of his friends whenever He-Who-Shall-Not-Be-Named slithers away yet again. At times the first season relies far too heavily on narration to get from Point A to Point B, especially considering how well the story moves in certain places with no dialogue at all. The fourth episode “The Palace in Flames” is especially reliant on the soothing voice of Holbrook’s Murphy; though it’s admittedly helpful in orienting a viewer with only a tangential knowledge of the Legend of Escobar, it approaches overkill on more than one occasion. By the end of the first season, Pablo has transformed his jungle operation into a sprawling trafficking empire, moved a stupendous amount of cocaine into Miami and Los Angeles and other ports in the U.S., been elected to the Colombian Senate, been ejected from the Colombian Senate, hired a Communist extremist faction to destroy an entire courthouse, assassinated a newly-elected President, blown up a commercial airliner, built his own mansion and convinced the Colombian government to allow him to stay there instead of prison, and escaped from the mansion/prison when the military executes a raid. This is essentially enough material for an entire series, or a race-to-the-finish final season, and yet Narcos opts instead to hit the ground running in rare fashion. With Netflix holding tradition and renewing the show for a second season already, all we have to do is try to keep up.